I understand what the author was trying to do here but for me it missed the mark. I enjoyed Marc and Raphael but although Raphael was a good character,I did like that it showed him interacting with the two people, he unfortunately never recovered from the start. The start is what didn’t work for me. I wish the author used another tool to get Marc to working with Raphael. The fact that the job was created for him so Raphael could sleep with him gave me the heebies and it carried through the whole book. I also felt that time was spent getting them together, and then all of a sudden, marc was thinking I’m falling for him and then in the next breath telling Raphael that he loved him, and then immediately doors to confidential info was opened, it sped up too quickly and boom done. 5.0 out of 5 starsA sweet and hot story. 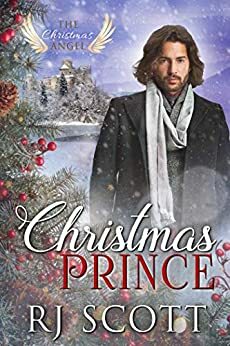 RJ Scott is one of my absolute favorite M/M authors and her Christmas books have all been wonderful; Christmas Prince is a great addition to her list. Marc and Raphael are made for each other but Raphael has to learn that it can be forever and not just a temporary thing. I loved how Marc was not intimidated by Raphael's aristocracy and didn't really hesitate to speak his mind and let him know when he was out of line. RJ's beautifully descriptive writing painted a stunning portrait of Raphael's country, the people in it, his home and his family. It was wonderful to see how The Christmas Angel worked her magic for these two men and the epilogue for the story was absolutely perfect. 5.0 out of 5 starsWho Doesn't Want Their Very Own Christmas Prince? Christmas Prince is a wonderful holiday story. Prince Rafe and museum curator Marc have amazing chemistry and the entire story is a joy to read. From the opening at an auction to the epilogue I was entranced. Ms. Scott provides amazing descriptions of the surroundings and it is very easy to fall into this fairy-tale land of Montaunoit. If you enjoy Christmas stories, this is one to not miss. 4.0 out of 5 starsThe historian and the Prince. Christmas Prince is a sweet Christmas story of finding love in an unexpected place. After meeting historian, Marc, at an antiquities auction the Prince can’t get him out of his head. A temporary job brings Marc to the Palace and chemistry takes over from there. 4.0 out of 5 starsAwww! This was a sweet, low-angst love story. Rafael is an arrogant prince with a heart of gold. And Marc is an uptight, insecure and kind hearted man deserving of love. Great easy read. I love this author's stories. This book is just as wonderful as the other books in this series and as the other books it made me very happy. The ending was abrupt as I wished it could go on forever.